Unicef’s decision to play its Joker Card for Race 12 to Derry-Londonderry has certainly proved to be a good one with the team due to shoot up the overall Leaderboard following its second place finish in Northern Ireland. And Garmin has secured the final podium position, coming in third place. Unicef crossed the finish line at 04:32:50 UTC, just over four hours behind Visit Seattle, to complete the 3,000 nautical mile race across the North Atlantic in just over 13 days. Instead of just collecting eleven points for second, the Joker means Unicef will add an impressive 22 points to its overall tally, plus three bonus points for being the first across the Scoring Gate. Whilst the Leaderboard won’t be finalised until the full fleet has completed Race 12, it means the eighth placed Unicef could be as high as fifth going into the thirteenth and final race to Liverpool. Meanwhile, Garmin is also keeping the pressure on the teams at the top of the overall standings after taking third place. 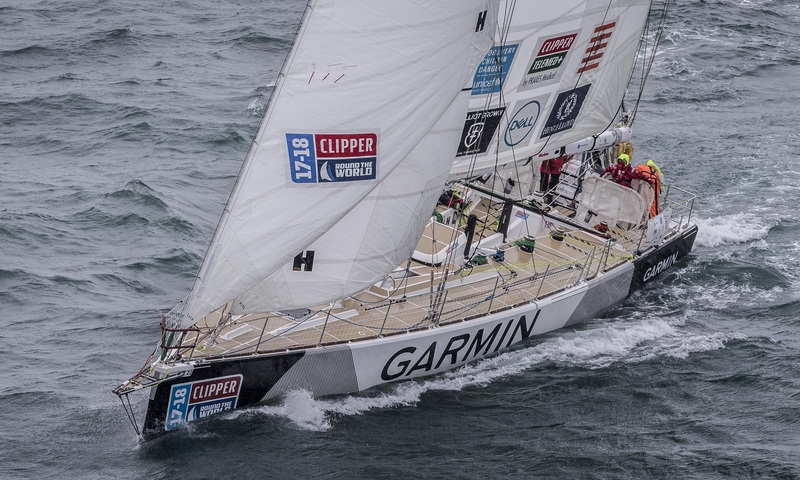 Garmin crossed the finish line at 05:13 UTC, just 45 minutes behind Unicef to secure what is the team’s third podium of the Clipper 2017-18 Race. Garmin spent much of the early stages of Race 12 less than 10 nautical miles astern of Unicef, HotelPlanner.com, Dare To Lead, and Sanya Serenity Coast, and could physically see Visit Seattle when it went for the Scoring Gate on Day 7. The decision to go for the Scoring Gate paid dividends with Garmin collecting one bonus point, which will help the currently fourth ranked team stay towards the top of the standings. In addition to this they were the second fastest team in the Elliot Brown Ocean Sprint - boosting their points total for Race 12 by a further two. Unicef and Garmin are expected to arrive in Derry-Londonderry from 1230 local time. Any changes or updates to the time will be made on the Clipper Race website here, and weather depending, the arrival will be broadcast on the Clipper Race Facebook Live Page. You can also follow the progress of the rest of the fleet to Derry-Londonderry on the Race Viewer.